Does anyone have 30 goats to lend Chicago’s O’Hare Airport? 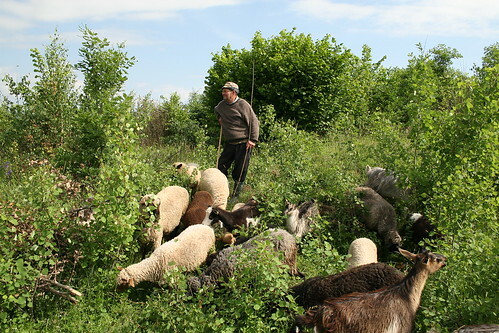 Goatscaping is not a new concept, but the cheap eco-friendly landscapers are gaining popularity among airports looking to cut costs while maintaining well-groomed grounds. Travelers may soon be doing a double take when they gaze out their plane windows at O’Hare International Airport, the latest location to consider trading in lawn mowers and landscapers for goats. Google, Yahoo, and San Francisco’s airport have been using goats for years to maintain their lawns. Photo by Paul White. The Chicago Department of Aviation is looking for about 30 goats and a herder for a pilot program, aimed at taming the grass and weeds in one area of the airport grounds that’s difficult to mow. The agency is the latest government body to find that goats not only never ask for a pay raise or take vacation, they can also get to those had-to-reach spots.